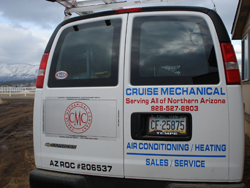 CRUISE MECHANICAL offers free estimates and our goal is to provide a safe, quality and comfort system or systems for your home. We strive to maintain efficiency and energy for your heating and cooling situation. Our staff can design and install a system for the right amount of comfort for your home. We provide a planned service agreement to keep up the quality of your equipment. Call us today for a free estimate and consultation. We are a proud member of the ACCA of AZ. this files, Click to download the Acrobat Reader.